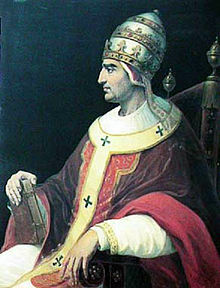 Pope Gregory XI (Latin: Gregorius; c. 1329 – 27 March 1378) was Pope from 30 December 1370 to his death in 1378. He was the seventh and last Avignon pope and the most recent French pope. In 1377, Gregory XI returned the Papal court to Rome, ending nearly 70 years of papal residency in Avignon, France. His death shortly after was followed by the Western Schism. Gregory XI did not long survive this trip, dying in Rome on 27 March 1378. He was buried the following day in the church of Santa Maria Nuova. After his death the College of Cardinals was pressured by a Roman mob that broke into the voting chamber to force an Italian pope into the papacy. The Italians chose Urban VI. Soon after being elected, Urban gained the Cardinals' enmity. The cardinals withdrew from Rome to Fondi, where they annulled their election of Urban and elected a French pope, Clement VII, before returning to Avignon in 1378. ^ Herbermann, Charles, ed. (1913). "Pope Gregory XI" . Catholic Encyclopedia. New York: Robert Appleton Company. ^ George L. Williams, Papal Genealogy: The Families and Descendants of the Popes, (McFarland Company Inc., 1998), 43. ^ Hayez, Michel (2002). "Gregorio XI, papa". Dizionario Biografico degli Italiani. 59. Rome: Istituto della Enciclopedia Italiana. ^ a b "The Condemnation of Wycliffe". Plato.stanford.edu. Retrieved 2013-06-23. ^ "first Quarter of the 14th Century stooping (county Hoya), 1374 Avignon". Deutsche-biographie.de. 2012-06-13. Retrieved 2013-06-23. ^ Francis Thomas Luongo, The Saintly Politics of Catherine of Siena, (Cornell University Press, 2006), 25. Carolyn Muessig; George Ferzoco; Beverly Kienzle (2011). A Companion to Catherine of Siena. Boston-Leiden: Brill. pp. 94–95. ISBN 978-90-04-20555-0. ^ Francis Thomas Luongo, The Saintly Politics of Catherine of Siena, xii. ^ Margaret Harvey, The English in Rome, 1362–1420: Portrait of an Expatriate Community, (Cambridge University Press, 2004), 3. ^ Carol M. Richardson, Reclaiming Rome: Cardinals in the Fifteenth Century, ed. A.J. Vanderjagt, (Brill, 2009), 1. ^ F Donald Logan, A History of the Church in the Middle Ages, (Routledge, 2002), 308. ^ Joseph Dahmus, A History of the Middle Ages, (Doubleday Book Co., 1995), 381. ^ a b Joseph Dahmus, A History of the Middle Ages, 381.